Ad-Aware Plus Adds Features Above The Free Version--But Is It Better? The Ad-Aware series of products have long been known primarily for Ad-Aware Free, a famous and free piece of anti-spyware software. But Lavasoft's products include for-pay Ad-Aware Plus and Pro versions as well. Designed primarily for businesses, Ad-Aware Pro (various pricing; $40 for a one-year, single-user license) includes anti-virus, network protection, and a variety of advanced tools. The Pro version is the most comprehensive program in the lineup. Ad-Aware Pro protects against viruses and network dangers, but it's not clear that these benefits are worth the price. 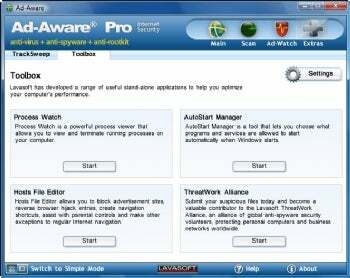 As with Ad-Aware Free and Plus, Ad-Aware Pro also scans for spyware, in addition to viruses. There's certainly room for improvement over the last version, Ad-Aware Anniversary Edition. Security company AV-Test.org found in tests that Ad-Aware's Anniversary Edition was able to locate only 83.6 percent of 111,833 Trojans, spyware and other malware samples--not an impressive result compared to its competition. No such tests have been run on the newest version of the software, so there is no way to know whether the software has been improved. One reason to hope for a better showing in this version is the inclusion of several types of heuristic detection. Heuristic detection protects your PC by examining complex system behavior, rather than just looking for known malware signatures. If the program's heuristics work as well as do the heuristics in other anti-malware software, it should provide better protection against emerging and unknown threats, as well as against threats that are already known. The Pro version also includes protection against network-borne threats, which neither the free nor Plus versions do. In addition, the Pro version has what it calls the "Toolbox" of additional protection. The Toolbox includes items such as the AutoStart Manager, which lets you control what programs and services start at Windows startup. It also includes a way to view and kill processes running on your PC. In addition, there is a tool to edit your HOSTS file, which may help increase your security. The final tool in the toolbox does not directly help security; it submits any dangers you come across to the Lavasoft ThreatWork Alliance, which then uses the combined information it finds to uncover dangers. Overall, the toolbox is moderately useful. As with the other new versions of Ad-Aware, Ad-Aware Pro promises to protect you against malware that tries to restore itself after a system reboot. And it now integrates with Internet Explorer to scan files as you download files from the Web, alerting you to any malicious files you may send to your system. PC World has not tested these features. Also new to this version is a "Simple mode" that lets you set your configuration once, and never have to do it again. If you prefer, you can toggle to Advanced Mode, where you can select advanced features for customization. The question for the Pro version of the software is whether it is worth $40. Many free anti-virus programs, including Microsoft Security Essentials, Avira AntiVir Personal, and Avast! Home Edition offer competent anti-virus protection for free, so it doesn't seem as if it would be worthwhile for a home user to pay for anti-virus protection. As for the extra tools that Ad-Aware Pro offers beyond virus protection, it may not also be worth paying for them, either, given that they are of only moderate usefulness. Business users may be content with Ad-Aware Plus. If you're looking for an antispyware program for your home PC, though, Ad-Aware Free still contains the best of what the Ad-Aware tools have to offer--and in that program, they're still free for personal use.